Kremlin’s Political Clans Start Competing Ahead of Possible Reshuffle - Integration Through Media ....! 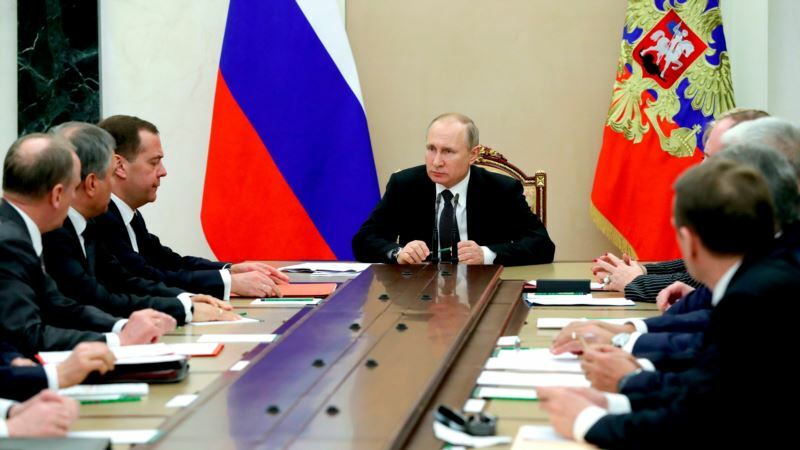 (VOA): Reelected to a new term, Russian President Vladimir Putin is due to announce his ministerial lineup next month, but there are already signs that his long-time prime minister, Dmitry Medvedev, is being reined in amid maneuvering by Moscow’s political clans, say analysts. One of Medvedev’s oligarch allies, Ziyavudin Magomedov, has been arrested and accused of large-scale embezzlement of state funds in connection with energy projects and the construction of a World Cup stadium in the Russian enclave of Kaliningrad. Few observers in Moscow believe the tycoon’s arrest could have happened without Putin’s approval. In January, the 49-year-old Magomedov, whose worth Forbes magazine estimates at $1.4 billion, was on a list of high-ranking officials and plutocrats U.S. authorities said they considered close to Putin and his inner circle. Magomedov is a friend and political ally not only of Russia’s prime minister, but also a confidant of Deputy Prime Minister Arkady Dvorkovich. He was arrested Saturday along with his brother, Magomed Magomedov, and ominously, both are being held at Lefortovo, the former KGB detention facility. High-profile casualties are expected in the jostling of Kremlin factions as Putin enters what some analysts suspect might be his final six-year term as president. Even before Russians headed to polling stations last month in an election marred by allegations of vote-rigging, Moscow was already abuzz with speculation about what Putin might be planning after his election victory and whether he would alter the Russian constitution to seek a third consecutive term. A Kremlin insider told VOA that he suspects Putin has not made up his mind, adding to the fears of various clans, broadly, but messily split, roughly between a security faction, the “siloviki,” and technocrats. A newer generation of princelings – the sons of plutocrats and Kremlin bosses – is also vying for bigger roles. “The divisions are a lot more complex than most observers appreciate,” said the insider, who has worked in the administrations of both Boris Yeltsin and Vladimir Putin. The 49-year-old Ziyavudin Magomedov, who comes from Russia's Dagestan, owns Summa, a sprawling conglomerate of energy, infrastructure, construction and agriculture businesses. His rise from being the owner of a little-known central Asian pipeline company was meteoric and owed much to his ties to Medvedev, say business analysts. More recently, he has pushed the idea of shaping a “New Silk Road,” connecting the Far East to Europe via a high-speed rail link. Peskov’s remark, though, hasn’t quieted conjecture. “It’s clear this is a blow to Medvedev’s image,” political consultant Evgeny Minchenko told the newspaper Vedomosti. Minchenko said that currently most observers believe Putin will reappoint Medvedev as prime minister, but added, “It’s possible that different elite groups have a different view on that.” It is also possible Putin has decided to diminish Medvedev. Some analysts see the hand of Igor Sechin, the head of Russian oil giant Rosneft, as behind the arrest. Sechin is widely viewed as the leader of the Kremlin's siloviki faction and in the past, has blocked two of Ziyavudin Magomedov’s maritime and energy ventures – in the Baltic and the Black Sea – and stopped an expansion effort into shipbuilding, say business analysts. Ziyavudin Magomedov’s arrest is reminiscent of the 2014 detention of another Sechin rival, Vladimir Yevtushenkov, who was investigated for money laundering. Yevtushenkov was freed after the Bashneft oil company he owned was re-nationalized and subsequently auctioned off to Rosneft. The last time there was uncertainty, in the years leading up to 2008 when Putin had to decide whether to rewrite the constitution or temporarily trade places with his prime minister Medvedev, power struggles erupted within the Kremlin as major players maneuvered to ensure their own safety or jockeyed for the chance to succeed Putin, if he decided to quit. There were casualties then in the factional struggle for supremacy and survival, a struggle Putin seemed to encourage, inadvertently or otherwise, by delaying a decision on his plans, prompting those who reckoned they could succeed him, or who wanted to anoint a successor themselves, to start infighting. That in turn led to a clampdown by Putin.